Kim Smuga from Comixpedia reviews The Joy of Tech. 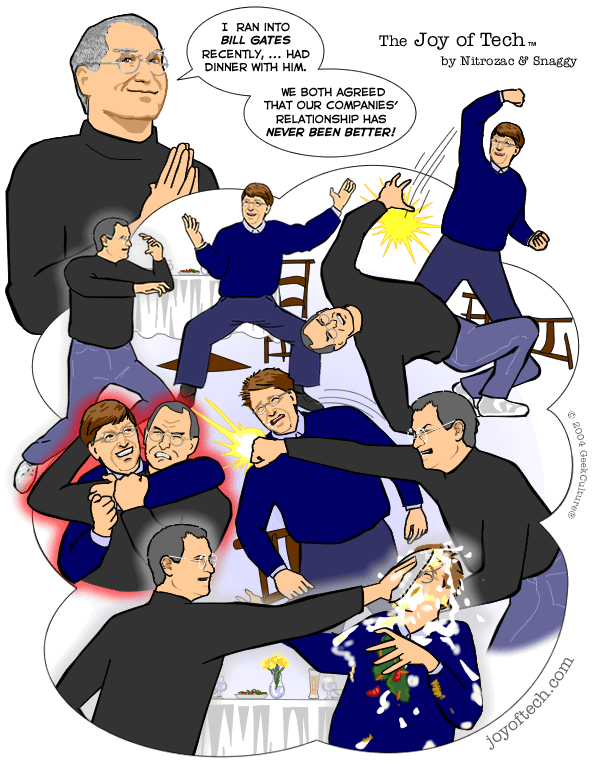 What is your favorite move of The Battle of the Tech Titans? Gates's "come and get me" stance. Gates's sucker punch to Jobs. The Death Grip of Gates. Jobs's "One More Thing" Pie-in-the-Face. I'm kinda hoping they will wipe each other out. Email a friend some Joy of Tech! Help keep the joy in Joy of Tech... tip the cartoonists! And in SuperFan Clubhouse Tidbits: dragonman97 invents perl bars and educational bars in Trinity, Help! ....and don't forget... those SuperFan Subscriptions! Get access to the SuperFan Clubhouse, custom avatars in the Forums, and as a SuperTreat, Solid Nitrozanium SuperFans can appear in the comic!